An ordinary person can estimate reinforcement as lumsum. 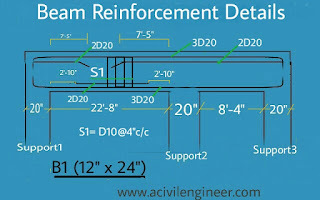 I see many people estimate reinforcement as a percentage of concrete volume. Such as 2% or 1.5% of concrete volume. But as a construction professional you shouldn’t estimate rebar quantity as percent of concrete volume. You should estimate that as shown in the structural drawing. Estimating rebar quantity is easy. All you have to get the cutting length for each type of bar in the beam. Let’s start estimating. We’ll use the following image as a structural drawing of beam. If you don’t know the name of bar on different location in a beam then read the following post. You’ll get this data from the general notes sheet of structural drawing. 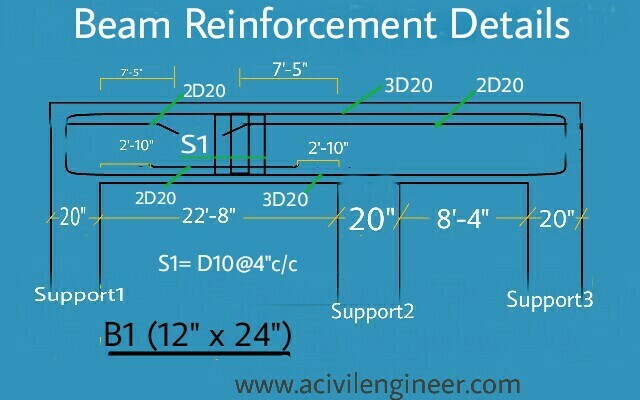 We have enough data to estimate the beam reinforcement. Let’s estimate. Apply the following formula to get the cutting length of top longitudinal bar. We know the full length of a reinforcing bar is about 40′. The length of a top longitudinal bar, we are estimating, doesn’t exceed the length of a full bar. So you don’t have to add lap length. The formula for calculating the cutting length of bottom longitudinal bar is same as the formula for top longitudinal bar. So the length is also same as T1 . That is 37′-1″. For estimating stirrup you have to calculate the required number of stirrup for the beam and cutting length of bar for a stirrup. = (22′-8″)/4″ +1 = 69 + 1 = 70 nos. = (8′-4″)/4″ + 1 = 25 + 1 = 26 nos. Total number of stirrups = 70 + 26 = 96 nos. = 111′-3″ + 111′-3″ + 19′-3″ + 19′-7½” + 34′ = 296′. But steel reinforcing bars are measured in kg in the market. So you have to convert the bar length to kilogram. Unit weight of 10 mm ø bar is 0.188 kg/ft and 20 mm ø bar is 0.75 kg/ft. Read the following post to know how to calculate unit weight of reinforcing bar. When you want to purchase reinforcing bar for the beam you should add 5% more with your estimated quantity as wastage. Please share your experience about estimating in the comment below.